This is hysterical. You have to try this. It is absolutely true. I guess there are some things that the brain cannot handle. You have to try this, it takes 2 seconds. I could not believe this! It is from an orthopaedic surgeon. 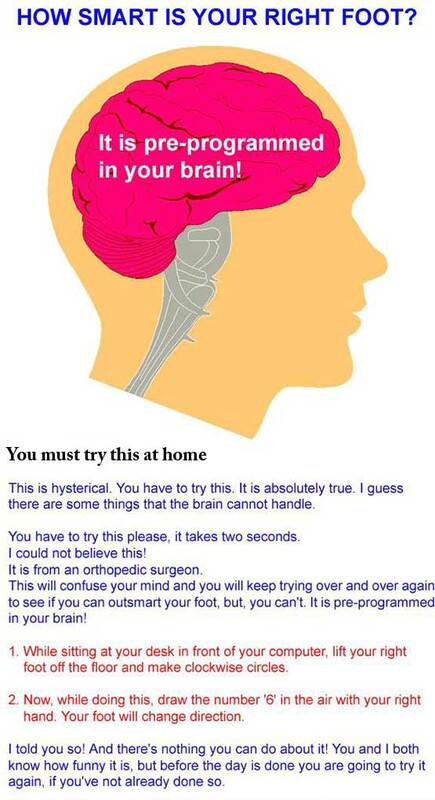 This will boggle your mind and will keep you trying over and over again to see if you can outsmart your foot. It's pre-programmed in your brain! 1. While sitting at your desk in front of your computer, lift your right foot off the floor and make clockwise circles. 2. Now, while doing this, draw the number '6' in the air with your right hand. Your foot will change direction. I told you so! There's nothing you can do about it! You and I both know how stupid it is, but, before the day is over, you are going to try it again. Archaeologists have finally come up with an explanation as to why man eventually began walking upright. To free up their hands for masturbation.